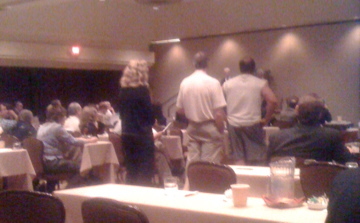 The 2008 ASBP scientific meeting in Phoenix, AZ was amazing! Sitting in a room full of bariatric physicians with lecturers who sometimes sound like they're speaking a foreign language with all the science and medical jargon they spout off isn't exactly the most ideal way to spend a few days away from home. 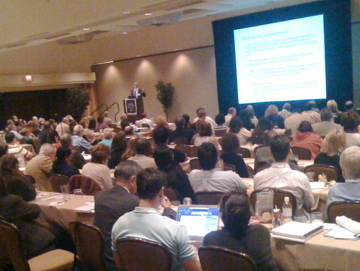 But when all of the top low-carb researchers and practitioners from North America gather in one place to share their latest findings in the world of livin' la vida low-carb, you can't help but get super-excited about what is to come in the future of diet and health as the evidence in favor of low-carb diets continues to mount. What a weekend it was! 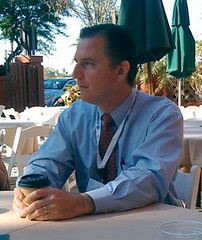 Sponsored by the American Society of Bariatric Physicians, the 2008 Nutrition & Metabolism Society Seminar held in Phoenix, Arizona presented the science supporting the low-carb lifestyle from the biggest names in the world of low-carb research--Phinney, Westman, Vernon, Volek, Feinman, Wortman, Tarino, and German. This year's conference included two half-day sessions on Saturday afternoon and Sunday morning that was in my opinion even better than the one in Nashville, TN last year. 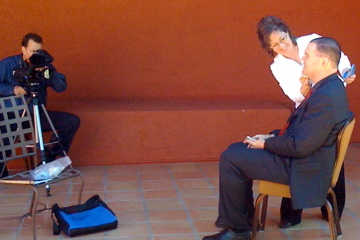 My only regret is that I didn't have a chance to interview more people at the conference than I did. However, I did get in a few outstanding ones in my limited time--Dr. Richard Feinman, director of The Nutrition & Metabolism Society and co-Editor-In-Chief of the Open Access online journal Nutrition & Metabolism, Drs. 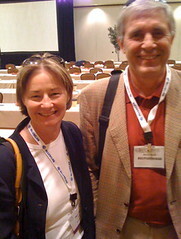 Mike and Mary Dan Eades from Protein Power (see Dr. Mike's blog post about the conference by clicking here), the producer of the hit CBC-Newsworld documentary film My Big Fat Diet (which we were able to watch on Sunday morning) about a group of First Nations people who returned to their native high-fat, low-carb diet named Mary Bissell, and a 45-minute chat with the author of Good Calories, Bad Calories Gary Taubes. These and MANY more interviews for my podcast show will be coming in the next few months from various people who attended the conference, so get ready. 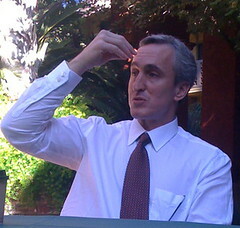 Speaking of Gary Taubes, it was such a pleasure meeting him in person. He's taller than I thought (he said the same thing about me) and could literally talk for hours about this unique role of carbohydrate in the obesity epidemic. You could really sense all the years he has invested in this subject has shaped his thinking about this so acutely that he is now a man on a mission. And he said it on several occasions throughout the weekend that he plans on pursuing this for as long as he has the energy and desire to do it. We need people like Gary Taubes who are unwilling to back down just because the message goes against conventional wisdom. He is certainly on the forefront of a revolution that could very well see a breaking point very soon. JACKIE EBERSTEIN, who worked with Dr. Atkins for three decades and is one of the most knowledgeable Atkins diet experts in the world today. 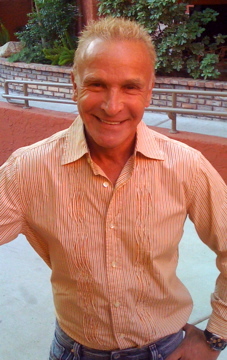 DR. JONNY BOWDEN, author of Living The Low-Carb Life and various other books on nutritional health. It was a genuine surprise to see him there and he didn't even recognize me at first when I was speaking with Dr. Jeff Volek. Jonny greeted Jeff and started to walk away when I said, "Hey Jonny, it's Jimmy Moore!" The look back on his face was priceless! :) THANKS Jonny! It was a real pleasure meeting Melanie Vogan from Atlanta Teleproductions, Inc. who was filming various interviews with people behind the scenes in the world of low-carb and I was honored to be a part of that. Melanie and her husband snagged a whole bunch of footage from everyone to piece together a documentary about the healthy low-carb lifestyle. I'm excited about this chance to share low-carb living in such a positive manner and Melanie is just the person to do it. She's fully committed to using her talents in the video broadcasting realm to make it happen. We'll be hearing more from her in the future and I'll let you know when the documentary will be available. The days went kinda like this: wake up, go to breakfast (they weren't the best in the world considering this was an OBESITY conference), listen to a few lectures, take a break, listen to a few lectures, a time for questions and answers, go to lunch (which weren't any better than the breakfast! 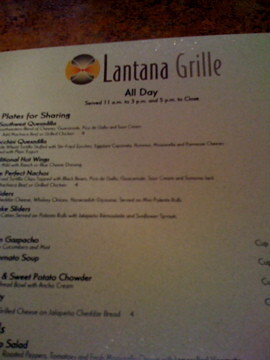 ), listen to a few lectures, take a break, listen to a few more lectures, ask more questions from the speakers, and then go on your own for supper where most of us hung out at the Lantana restaurant each night just to chit-chat about whatever (the supper menus were the best--check out what I ate during this trip at my menus blog). Sounds riveting, doesn't it? Actually, YES IT WAS!!! When you get to come face-to-face with all these people you blog about, this is a VERY big deal. I liken it to being at the Super Bowl (which ironically was in Phoenix this year!) for fans of livin' la vida low-carb. 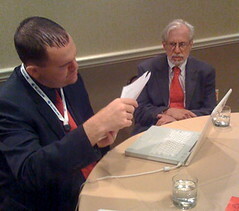 It was kinda cool sitting across from Dr. Eric Westman and Dr. Mary Vernon while sitting next to Drs. Mike and Mary Dan Eades for supper (in fact, Dr. Mary Dan couldn't finish her steak, so I happily obliged!). 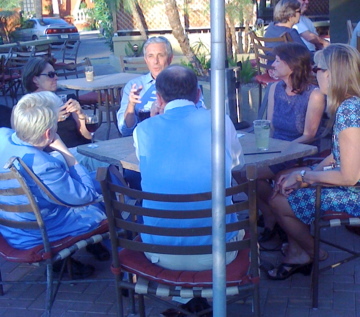 Rubbing elbows and listening in to the conversations that went on was absolutely priceless. I can't wait to share some of the findings that were presented at this conference as well as my interviews because it was a fabulous time for Christine and I to get away despite the hacker who brought down my forum just before I left. 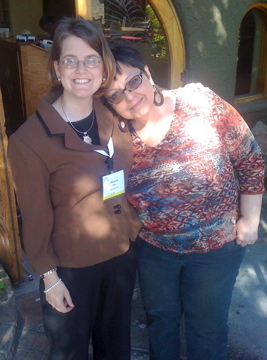 Although I didn't get to hang out with her as much, I was happy to see my friend and fellow blogger Laura Dolson from the About.com Low-Carb Diets site (you can read her comments about the Phoenix event by clicking here). We had a chance to talk briefly on Saturday night, but I would have loved to been able to talk some more. There just wasn't enough time in the weekend to fit it all in! The weather was certainly a shock to my system going from a cool, humid climate here in South Carolina to the hot, dry climate in Arizona. On day two when I was planning on several interviews with people, I totally lost my voice. My nasal passages were like the Sahara desert and my groggy voice was only soothed after several hot lemon tea sips and constant water helped lubricate the voice box again. Whew, I hated that feeling and would never make it living in Phoenix, Arizona. But it was a fun place to visit and meet several of my readers who live there. Dave and Kelly Damron (author of the book Tiny Toes and the blog Twin Peas) were very kind to pick us up from the airport and take us back on Sunday. 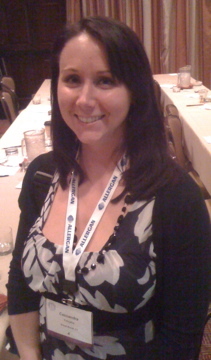 I've had my nightmare experiences with cabs in New York City, so Kelly helped prevent that from happening in Phoenix. 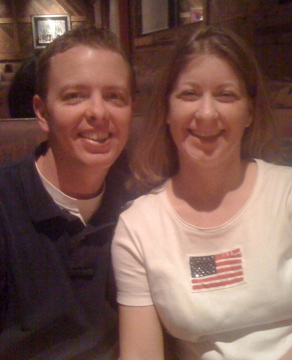 We enjoyed meeting up with them for dinner on Saturday night and talking about our failed IVF cycle experience in December. This is what Kelly dedicates herself to like I do low-carb, so it was kinda cool having someone who has been through it and survived despite great odds. Dave and Kelly both commented how well Christine and I have handled our situation and I told them it has only made us stronger as a couple. THANK YOU Kelly for all you are doing and I wish you and Dave all the best raising those little twin female munchkins. :) Hope to see you again someday. All in all, it was a superb few days in Phoenix and I'd like to personally thank The American Society of Bariatric Physicians for extending an invitation to me and Christine to attend. We appreciate the privilege of coming to events like this despite having no background in medicine or nutrition. Anyone who is interested in the subject of weight loss, diet, and health needs to know about the fabulous work of ASBP as well as the Nutrition & Metabolism Society. Dr. Vernon was commenting about how the Nutrition & Metabolism portion of the week tripled from what it was in Nashville last year. This is real progress and I expect the numbers will continue to rise each year as the evidence keeps building and building in favor of low-carb dieting for weight and health management (and diabetes was a HUGE focus of many of the researchers as they see this as the primary front for legitimizing low-carb once again to the general public). Here's my take-home message from this conference--get involved, take the passion you have for what you believe in, and make a real difference in the world. I'll be blogging more about some specific things you can do to put some grassroots feet to spread the word. Let's just say it's time to turn up the heat on Congressmen in Washington, the American Diabetes Association, the American Heart Association, and anyone else who needs to listen to the low-carb message in a clear, unbiased manner. I have been inspired to begin working on a major project to help facilitate this. Stay tuned for many amazing things to come on this front! Welcome back, Jimmy! The conference sounds awesome. I'll look forward to reading more about what you saw and heard. Glad you're back home safe. I missed your posts in your absence. Hope the forum situation can be resolved soon too. I miss that as well. When will you be announcing the fitcamp essay winners? Glad you had such an awesome time at the conference. Jimmy, I'm so glad you had a great time at the conference! I've been having Livin' La Vida Low Carb withdrawals, so I'm glad you're back, too! 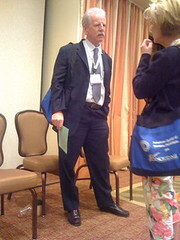 It's great that you had the opportunity to go to the conference. I'm looking forward to the information that you have "gained" there...to help us "lose"! I pray you'll be able get back the information lost because of the hacker. How sad. Thank you for all you hard work on our behalf.